It’s only natural to care about the people that we love in our lives. In fact, it’s only human nature just to care about people in general, regardless of how well we know them. When it comes to friends and family, the last thing that we want to see is someone struggling and going through a rough patch in their life due to a bad relationship, extreme stress at work, unhealthy eating habits, or a substance abuse problem. Yet, as much as we tend to care deeply about helping people that we love with their issues, it can be very difficult to actually address these problems, much less effectively communicate about them. Even if you do reach out to a loved one and express your concern for their behavior, they may reject your offer for help, coming across as offended or hurt on the basis that you’re judging them. Really, this isn’t a black and white matter. How do reach out to a friend or family member and express your concern without communicating any judgment? That question may seem like a tall order, but our drug rehabilitation clinic in Fort Collins can help. Acknowledging that the battle against substance abuse and chemical addiction is easier fought together than alone, Front Range Clinic uses tried-and-true methodologies combined with a loving, non-judgemental atmosphere to deliver positive and effective results with our patients. From alcohol addiction to tobacco (nicotine), opioid, cocaine, methamphetamine, benzodiazepine and other prescription medication addictions, we can help. Don’t wait to seek out help or talk to a loved one. Contact Front Range Clinic today to take the next step in the right direction. Below are some suggestions to help you effectively reach out to people in your life in a loving manner. Whether the afflicted person in your life realizes it or not (oftentimes they will be in denial of their problematic behavior), addiction will eventually erode a person’s self-esteem. This will leave them feeling hopeless and helpless, and so it is absolutely crucial to reach out a loving, helping hand at this point in their life. You’ll want to make the point very clear that you’re not only offering your unconditional love and support during these trying times, but you’re also steering clear of any judgment that will make them feel uncomfortable. Now, with this in mind, don’t confuse unconditional love and support with enabling their behavior. Providing an at-home environment where your loved one can comfortably drink or continue their drug habit is only going to perpetuate their addiction, and it’s only going to make matters worse over time. Ideally, you should set clear boundaries and stick to them — then, they’ll know that you’re serious about their addiction. If they’re beginning to open up or even acknowledge that they have a problem, please, do not talk over them. It takes a great deal of courage and humility for an addicted person to talk to people in their life about their addiction, and the best way to react to this vulnerable honesty is to remain calm and listen intently. Not only does this prove that you care, but providing them with a chance to truly express themselves will likely lead to progress and positive developments in terms of working to recover from their addiction. Even if things reach an impasse or the person in question is clearly exhibiting reckless behavior, try to accept that the conversation can’t always happen on your own terms and at a time in which you choose. Ideally, you should allow this person the opportunity to choose a good time to have this conversation, or at least do it when it feels right and natural. All things considered, you’ll want to decrease any potential for an exchange that’s hostile or defense. Keep the dialogue open and the conversation should naturally flow. This comes back to being a good, patient listener — do you know exactly what this person has been through or what led them to use drugs or alcohol in the first place? Maybe you know some details about their life story, but chances are, you don’t know everything. Bear this in mind as you’re listening and talking with them about your concern for their addiction. Oftentimes, just acknowledging where they’re coming from is a huge step toward fostering trust and helping the afflicted person open up. With locations in Fort Collins, Greeley, Loveland, Longmont, Thornton, Lakewood, Aurora, Colorado Springs and Pueblo, Front Range Clinic provides easily-accessible services for the Colorado metropolitan population. 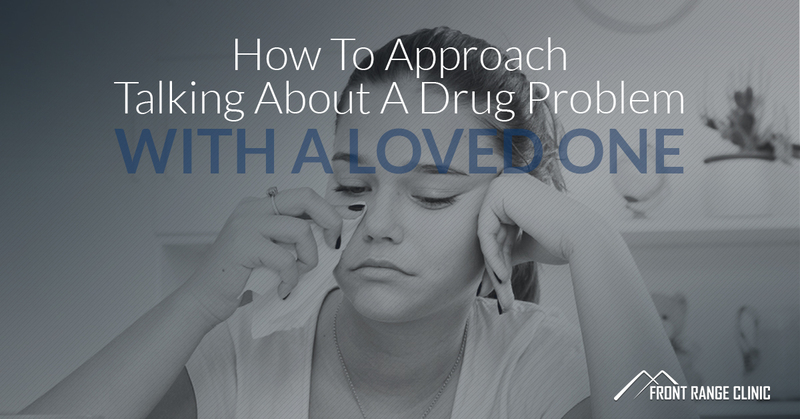 Get help for a loved one by contacting our drug addiction help specialists today.